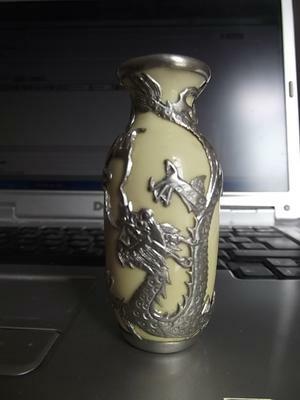 Hi there I am hoping some-one can help me Identify this minature vase. I can see no markings maybe a small diamond mark on the metal but I am not sure if this is just a nick. There are two dragons the eyes look like they are copper. The metal rim goes around the rim and bottom I cannot see a start or finnish. Its very pretty on what appears to be a lemon coloured porcelain. This is probably export ware, or made for tourists. You find virtually none on the local antique markets in the Far East.